Real-time pricing charges people different electricity rates depending on the time of day, and it has been shown before that ComEd customers save money by switching to real-time pricing. 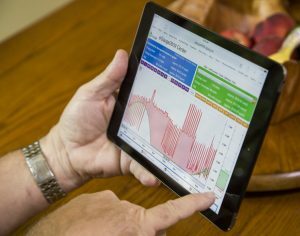 Last year, Environmental Defense Fund (EDF) and Illinois’ utility watchdog, Citizens Utility Board (CUB), came together to conduct one of the first analyses of anonymized energy-use data provided by ComEd. This early foray revealed that real-time electricity pricing would have helped nearly all ComEd customers save money in 2016, based on a study of over 300,000 homes. Our new paper takes that analysis a step further. For the purposes of this study, we developed a custom real-time pricing scheme to reflect how electricity should have been priced if the utility had perfect knowledge of historical system costs – i.e. looking back on actual data rather than relying on forecasts of energy demand. We then applied this pricing scheme, which is very close to ComEd’s Residential Real-Time Pricing, to ‘typical’ customers’ energy-use patterns. The giant pool of customer data was divided into several layers by year, season and day of the week. These subsets were further characterized using a statistical clustering algorithm. The study found that, given the same energy-use behavior, most residential customers on flat-rate billing would benefit – or save money – from moving to a real-time pricing scheme. Single households that switch to a real-time pricing scheme can save up to 30 percent on their electricity bills in comparison to flat-rate billing. Although consuming less energy undoubtedly saves money, doing so when real-time prices are cheaper is also a large determinant of electricity bills. This doesn’t necessarily mean you have to constantly check and adjust how much electricity you’re using. Although ‘flattening’ energy use – i.e. trying to make power demand consistent throughout the day – has traditionally been seen as an important factor in reducing costs, our results show that the same could be achieved just by shifting the time your ‘peak’ usage occurs. For example, instead of running your dishwasher around 7 pm when many people are home, awake and using appliances, you could save more money by running it a few hours later – during ‘off-peak’ hours. The potential for savings is most observable in the summer months because of high AC demands during the early evening hours. Moreover, shifting to a real-time pricing scheme will reduce overall system costs for the utility by optimizing the efficiency of the distribution network. A more efficient network means less waste, which is cheaper for everyone. The data-analysis collaboration between EDF and CUB is yielding more precise findings than ever before. We hope ours will not be a singular, isolated effort. Utilities must educate customers. Policy makers should encourage sustainable living. Researchers must continue to tackle tomorrow’s energy challenges. Dynamic electricity pricing is a step in the right direction, but how can we prepare the electricity grid for a future powered by renewable energy, or a future replete with electric vehicles? The continuous characterization of our power network is necessary for the realization of a cleaner and more efficient grid infrastructure. Energy data will be key to solving the puzzle – and we’re just getting started. This entry was posted in Illinois, Time of Use. Bookmark the permalink. Both comments and trackbacks are currently closed.